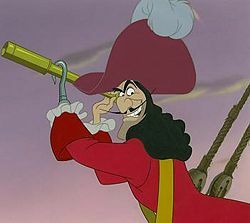 Captain Hook. . Wallpaper and background images in the Disney club tagged: disney movie captain hook. This Disney photo might contain anime, comic book, manga, and cartoon. Hook was voiced by Hans Conried and later voiced by Corey Burton.